Did you get excited seeing Lumpia on the photo? I'll do! This is my second favorite food next to Pansit. This is like updated version recipe, Since, I posted Lumpia recipe back when I started this blog which is like two years ago. I've seen few variations of lumpia recipe, so far I tried the Lumpia Shanghai- which compose of meat usually ground pork and Vege Lumpia- which compose of vegetables but some folks add some rice noodles into the mix. What kind of Lumpia is your favorite? 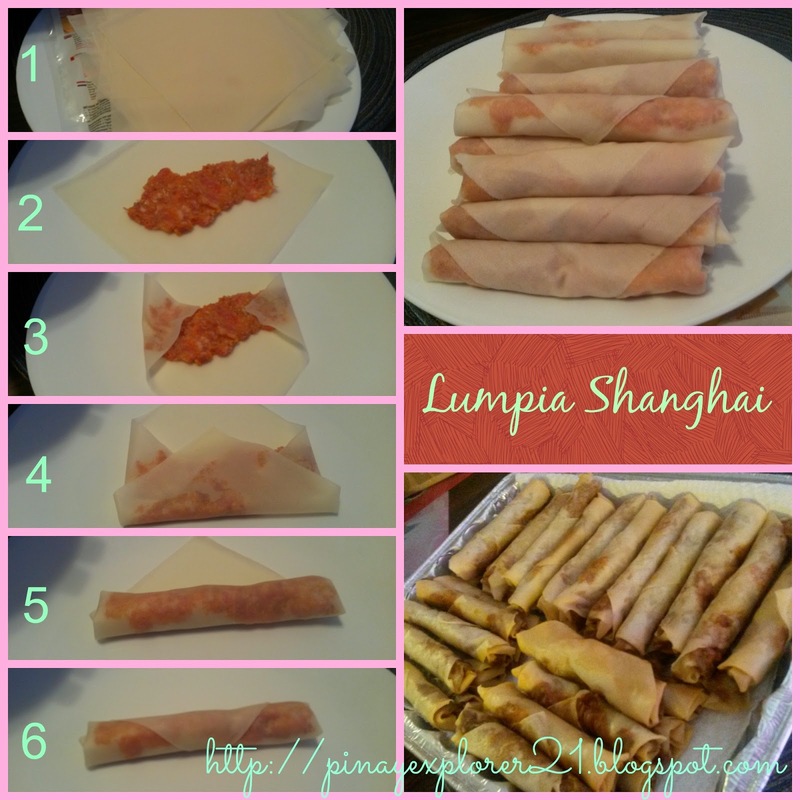 I prefer the Lumpia Shanghai myself, Since, I always made them for my daughter's birthday and some special occasions. Actually one of my favorite! In this blog post, I'll be showing the step by step on how easy it is to wrap the Lumpia. Awesome! Now, let's talk about the main ingredients? The Lumpia Wrapper- If you are living abroad, you'll find lumpia wrapper at any Asian store. The Lumpia wrapper is so thin, delicate and easy to dry up. Make sure that you put towel on the top to make sure that it will stay soft and easy for the wrapping process later on. What to do if the Lumpia wrapper is frozen? which is so typical when your living abroad. Some folks put some peppers, cabbage and other vegetables. I think they are equally delicious and I Love them all. What are your favorites on your Lumpia? The recipe that I'll be sharing you today is the recipe that my Mom taught me. So simple and so easy! C'mon you guys join me in my kitchen and I'll show you how easy it is to make this cute babies. So perfect for any occasion and surely impress everyone. * Put the carrots, onion and garlic in food processor ( if you have one) or chopped into little pieces. Set aside. In large bowl, mix all the ingredients ground pork, chopped veggies,breadcrumbs, egg, salt and pepper. Mix it together until everything is combine. Set aside. 1.) Carefully separate the Lumpia wrapper. 2.) Put spoonful of lumpia filling towards the center of Lumpia wrapper. 3.) Fold the two side towards the middle. Make sure that you leave a space on the middle. 5.) Start rolling the lumpia and make it tighter as you go. Make sure that you leave a little space. Brush it with water and it should seal the lumpia. 6.) Put the perfect rolled lumpia onto the container. DONE! Just do it all over again until your finish. How likely are you going to make Lumpia on your next potluck party? Anyway, I hope you find this recipe so easy and delicious. Its so perfect with sweet chilli sauce by the way. Yum! Looks delish! I often have a difficulty in making even lumpia rolls. Our lumpia is smaller than yours. I dunno if we have large lumpia wrapper. I haven't tasted this dish before.. but it sure looks like spring roll. Must try to make it one of these days. 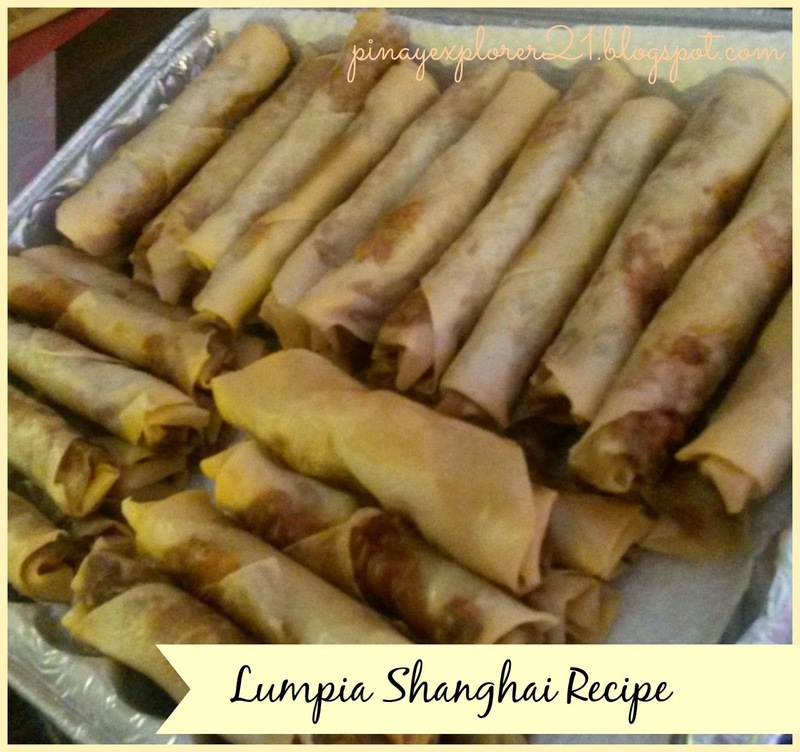 Next to dinuguan, lumpiang shanghai is my favorite fiesta/birthday/special occasion dish! No wonder I order lumpia even at fastfood chain. Thanks for this version of shanghai! I love lumpiang shanghai and this just made me crave for one. Daddy just made lumpiang GG naman anf it tastes good too. I agree that this will go best with pancit and cola.